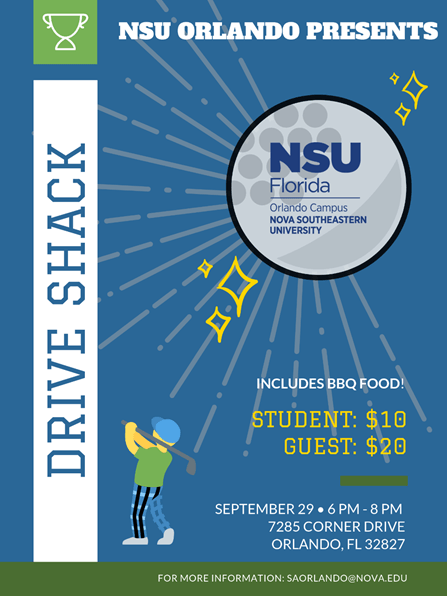 Come join your Student Government Association at Drive Shack on Saturday, September 29, 2018 from 6:00 p.m.-8:00 p.m.! Each currently enrolled student is allowed to purchase a maximum of 2 tickets, one for themselves and one for a guest. Tickets are limited and it’s on a first come first serve basis. Guest Ticket – $20 (we can only accept cash or check). You can RSVP here or tickets can be purchased in the Student Affairs office in the first floor lounge.